Happy Wednesday! 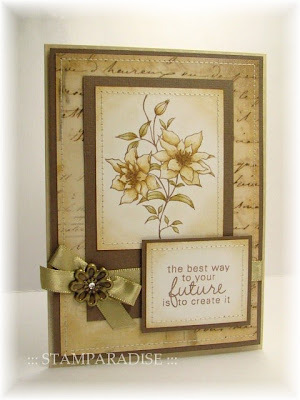 Today is the final day I show you my guest DT card at Creative Inspirations. This weeks theme is "Letters and/or Numbers". I used the decorative 'Y' stamp as a focal point. ( It isn't a hand-carved stamp! It is from 7gypsies.) 'Y' is the initial letter of my sister's first name. And the background paper I used includes a lot of letters. lol! 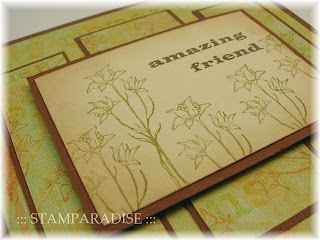 I stamped the letter 'Y' with Vintage Sepia ink (Versa Fine). 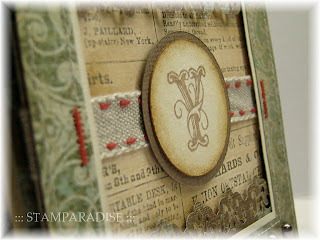 The circle panel and the background paper were distressed with Vintage Photo ink(Distress Ink). I adhered the circle panel and some stitched linen tape onto the background paper, and layered the dimensional frame which I made up with some design papers. I added 3 chocolate pearls to finish the card. I combined 2 challenges on this card. 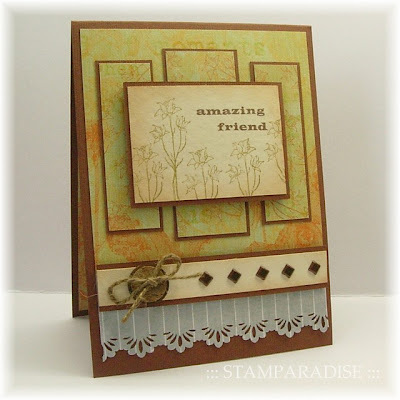 This weeks Our Creative Corner is challenging us to make a monochromatic card/project. So I used 'tan shade' on my card. And I used the sketch from Crazy 4 Challenges (C4C4). I colored the image with Distress Inks, and used Vintage Photo ink(Distress Ink) for distressing the all panels. I did stitching with sewing machine, and added gold satin ribbon and a metallic brad. This card is for this weeks Mercy's Sketch Challenge (MTSC 40). 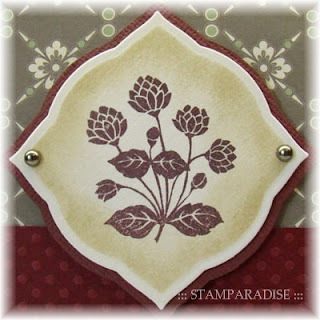 I carved a stamp of roses in the vase, and stamped it with Cafe au lait ink(Versa Craft). 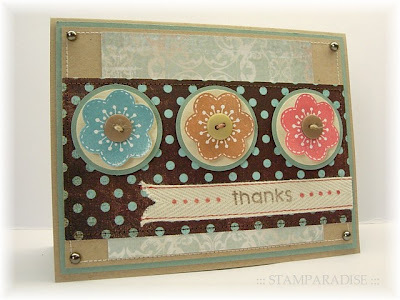 The sentiment was stamped over the image with Espresso ink(Versa Craft). The edges around the focal panel were sponged with Antique Linen(Distress Ink) and Cafe au lait ink. I layered each panels, did stitching with my sewing machine, and added some linen lace, a brad, and some tiny pearls. This card is for Mojo Monday 105. I'm sure that it is the first time I use grey on my card. The DP which I've used on upper background is from Colors Conspiracy. When I saw it, I immediately fell in love with it! It has classic and elegant look, doesn't it? And I thought it should be combined with yellow green. 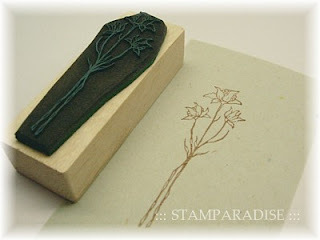 I carved and stamped a wild grass image with Azuki ink (Versa Craft). And then, I sponged around the image with Antique Linen and Old Paper ink (Distress Ink). To making a little circle layering part, I followed Julee's direction. Thank you so much Julee! 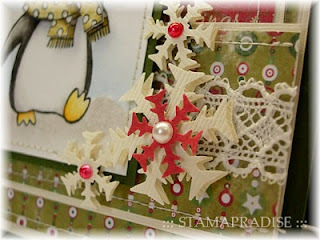 I did piercing around the background panel, and added some pewter pearls to finish the card. 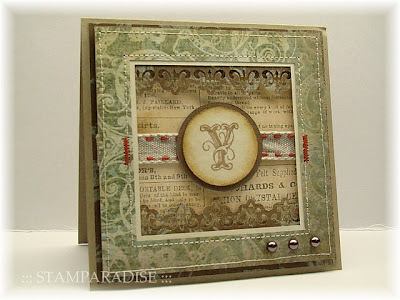 This is my GDT card for this weeks Creative Inspirations Challenge. The theme is "Autumn/Fall". It was a wonderful, but a little difficult theme for me. Autumn is the most favorite season of me, and there are a lot of things that remind me of autumn. For example, various autumn flowers, fallen leaves, autumn harvests, a dragonfly, a full moon, warm colors, and so on. So I couldn't determine easily what to use as a focul point. After thinking for a few days about it, I decided to make a simple and clean card. Because I thought "the silence" is one of charm in autumn. 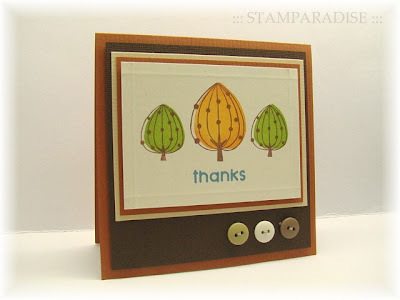 I made this card with no DP, no coloring, and minimum embellishment (only 3 buttons). The trees were stamped with Cocoa, Ninjin, and Muscat ink (Versa Craft). 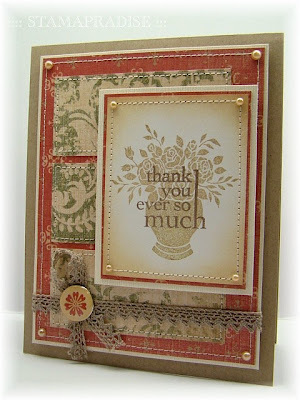 The sentiment was stamped with Soda ink(Versa Craft). I also enter this card to another 2 challenges. Stamp with Fun #25 (The theme is "Autumn") and Stamp Something (Their challenge is to make a card with our favorite colors). Here is an another penguin stamp I've carved. Yes, he is flying!!! 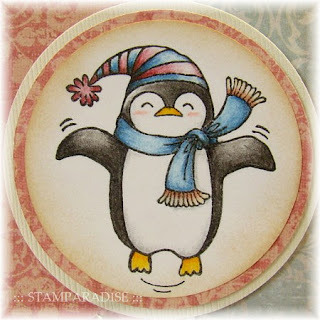 He is an amazing penguin! lol! 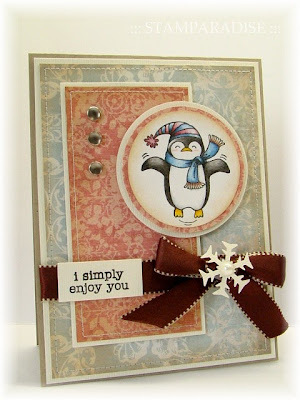 This card was used the sketch from Mercy's Tuesday Sketch Challenge #39 (MTSC39). I colored the image with Holbein Artist Colored Pencils and meltz Pen as usual. The edge of all panels were sponged with Sand ink(Versa Craft) and Antique Linen ink(Distress Ink). I did stitching with sewing machine, and added 3 glass brads, satin ribbon, and snowflakes. Thank you for looking. Have a nice day! Happy Wednesday everyone! 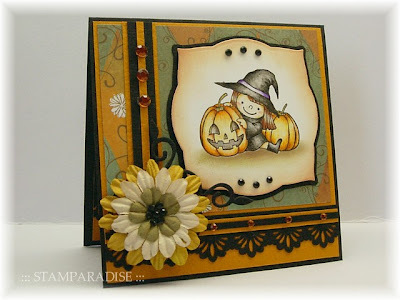 Today is the 1st day I show you a GDT card at Creative Inspirations! This weeks theme is "Animal". 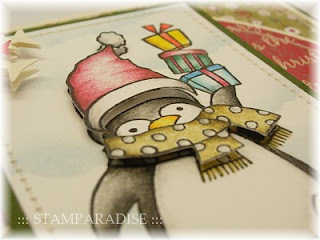 I carved the new stamp of a penguin carrying some present boxes to make this card. The card size is 4 1/2" ×　4 1/2". The image was colored with Holbein Artist Colored Pencils and Meltz pen, and his cap and muffler were layered. Background was made with masking and sponging techniques though it might be hard to see in the photo. 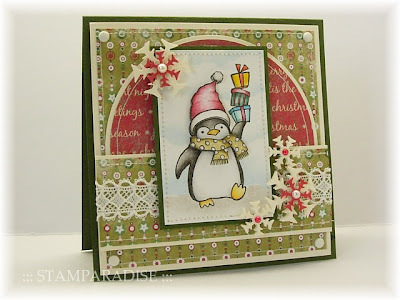 Please hop over to the Creative Inspirations blog and see the fabulous cards DT members have made. I hope you enjoy this weeks challenge! What do you think these flowers are?? Narcissus?? ...No. 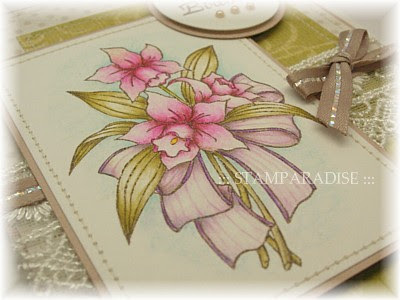 I've made a stamp of orchids, but I think it looks like narcissus. Sigh... Anyway, I'm going to show you a card I've made with this stamp! 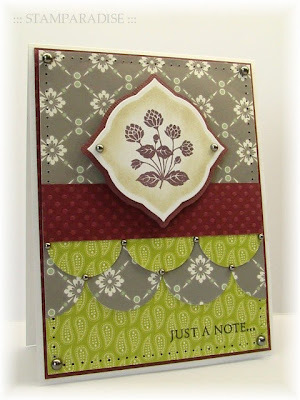 This card was used the sketch from Mercy's Tuesday Sketch Challenge(MTSC38). The image was colored with Holbein Artist colored Pencils and Meltz Pen as usual. I matted the image, did stitching with sewing machine, put each panels together, and added lace,ribbon, and some chino pearls. It's easy and quick card! lol! Paper: Kuretake, Bazzill, MF, K & Co. I made this card for Mojo Monday 103 which is contest week! I was chosen as one of the finalist in last month's contest. But this time, I'm sure that this card will not be chosen as a finalist as this card is not good......lol!! I made this card for Taylored Expressions Sketch Challenge #81. The size of this card is approximately 4.5" ×　4.5". 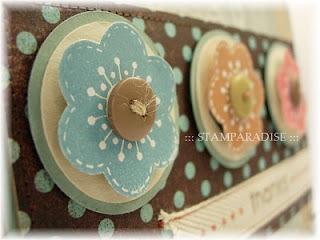 I love small size card lately because it is easy to make and cute! I carved this stamp about a week ago. But there were no chances to use it till yesterday. I colored the image with Holbein Artist Colored Pencils and Meltz Pen as usual. After I masked the image, I added some shades with sponging. 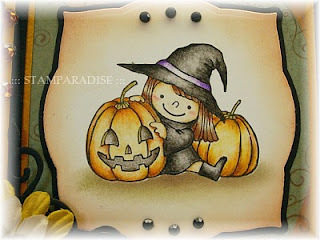 I wanted to add some striped ribbons to this card, but I had no ribbons which fit in with a Halloween theme. So I made striped lines with some slips of black and orange paper. 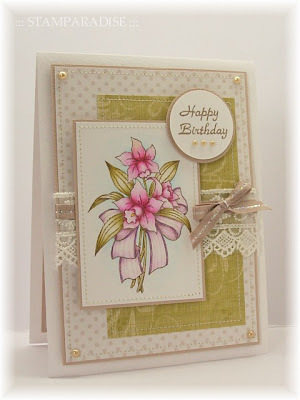 I added flowers and some rhinestones to finish the card. This has been exciting week for me...! I entered my friendship card to 2 challenges last week. That card have gotten a honor in both challenges!!! Can you believe it??? At the Creative Inspirations, I've been picked for the winner. The prize is a months guest designer post! I'm going to make a card along their theme for 3 weeks to inspire you. At the Stamp Something, I've been picked as one of the Top 5. I'm so proud of these honors! Thank you!!! I made this card for 2 challenges - the Mercy's Tuesday Sketch Challenge #37(MTSC 37) and the Flourishes Timeless Tuesday Challenge #31(FTTC 31). FTTC 31 require us to make a card without coloring. So I've used a solid floral stamp. I stamped it with 3 different colors (Soda - Versa Craft, Ginger Bread - Versa Magic, Brick - Versa Craft), then I cut them out and put them onto the circles. 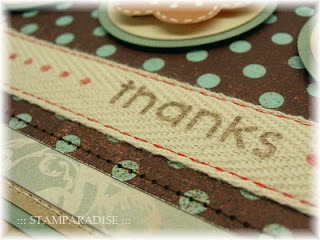 The sentiment and dotted lines were stamped on a cotton tape with Versa Craft inks. I sew it on the DP using my sewing machine.